TESTING cereal and pulse seed for germination and vigour could be one of the best investments growers make in the lead up to the 2019 winter crop plant. Seed quality plays a critical role in maximising emergence and early crop growth, and unsupported assumptions over the quality of retained seed can prove a costly mistake if crop establishment is poor. 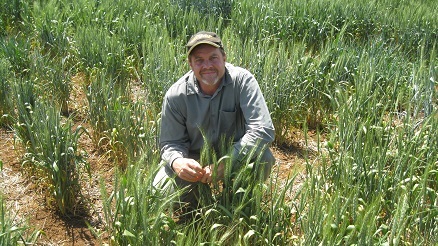 New South Wales Department of Primary Industries senior plant pathologist Steven Simpfendorfer is encouraging growers to undertake certified seed testing for germination and vigour at least two months before sowing so an alternate seed source can be arranged if required. He said testing was especially important if growers planned to use seed retained from the 2017 harvest or from crops impacted by drought, frost or late October rain in 2018. “Vigour and germination tests provide an indication of the proportion of seeds that will produce normal seedlings and this helps determine seeding rates,” he said. “As a result of poor seasonal conditions in 2018, particular attention should be given to determining vigour of retained seed for sowing in 2019. “The potential shortage of planting seed in 2019 means many growers may be in the situation of sowing seed retained from harvest in 2017 and storage conditions during this extended period are likely to have impacted on the germination and vigour of retained seed. While sowing rates can be increased to compensate for small reductions in seed germination, Dr Simpfendorfer said nothing could be done to alleviate the impact of poor seed vigour. “After a below average to poor winter crop season in 2018, recovery in 2019 starts with growers planting the best available seed possible,” he said. In addition to germination and vigour, Dr Simpfendorfer said retained seed should also be tested for purity/weed seeds and disease pathogens. Those growers sourcing planting seed from outside their immediate region are being urged to use a quality assured seed supplier which will ensure grain quality (purity, germination and vigour) is tested against a code of practice.